Home » Salad » The Best Vegan Macaroni Salad. The Best Vegan Macaroni Salad. 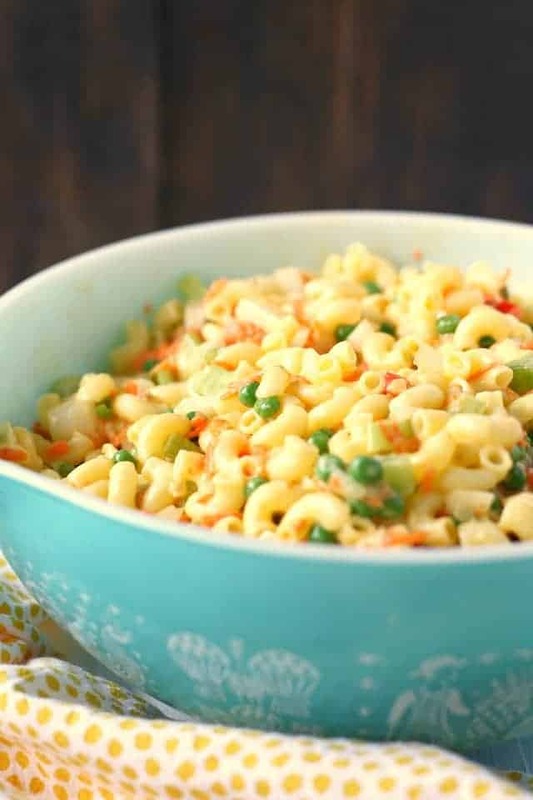 This vegan macaroni salad is loaded with colorful veggies and topped with a creamy, flavorful dressing. Your summer barbecue won’t be complete without this delicious side salad! What do you think of when you think about macaroni salad? Pale white salad with lots of mayo? Maybe a stray pea or two tossed in there? 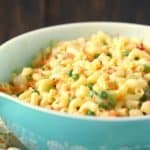 Usually when I see macaroni salad at a party or at the store, it seems kind of light on the vegetables and heavy on the dressing, but this vegan macaroni salad is loaded with lots of fresh vegetables. 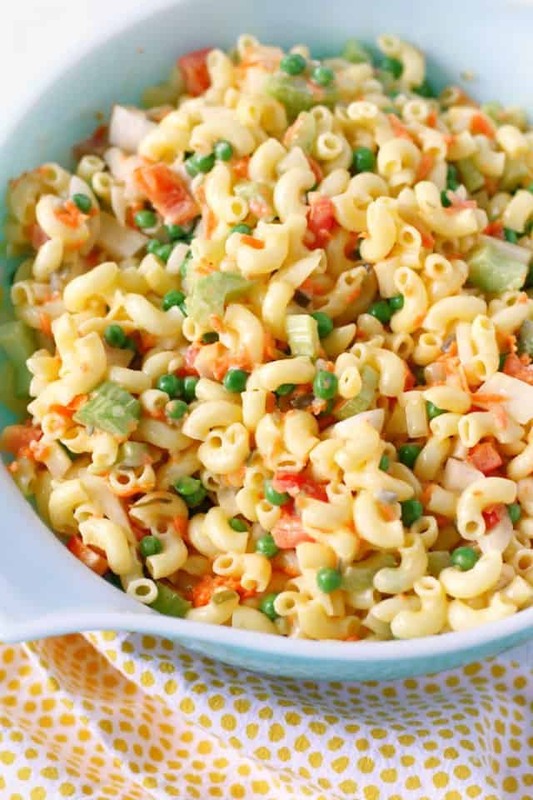 All those extra peas and peppers add a lot of color to this vegan macaroni salad, making it a pretty addition to the table. Can vegans eat macaroni salad? Sure, it’s actually pretty easy to make vegan macaroni salad with vegan mayonnaise. There are a lot of different brands of vegan mayo. You’ll need to choose the brand that works best for your dietary needs. But as long as you use vegan mayo, and leave out any animal products like tuna, or eggs, you’ll have an easy and tasty plant-based macaroni salad that everyone will love. The process is basically the same as making any macaroni salad recipe. You’ll need to use pasta that works for your dietary needs, and cook it and then cool it down. You’ll add your veggies, mix the dressing, and then add it to the bowl. Then you just stir it all up, and it will be ready to serve. You could do different colored peppers and onions if you wanted to add even more color to this vegan macaroni salad. 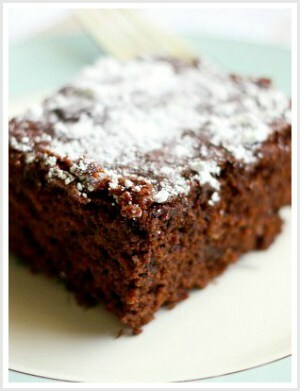 If you’re on a gluten free diet, no problem! 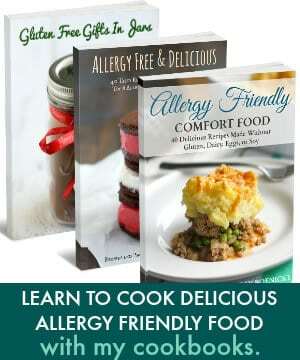 Just use gluten free macaroni noodles or gluten free penne. You can read about some of the different brands of gluten free pasta here. Make sure you don’t overcook the pasta – you don’t want the noodles to be too soggy or falling apart. 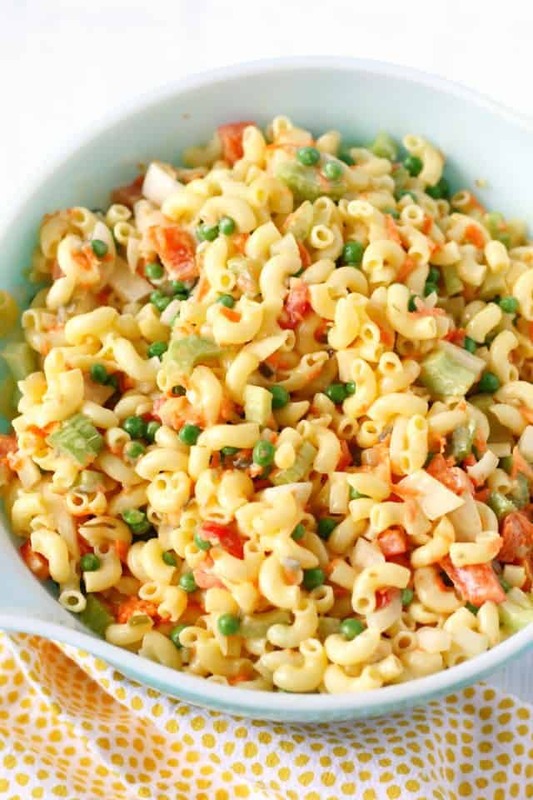 This macaroni salad is perfect for all those upcoming summer barbecues and picnics. It’s colorful, full of flavor, and suitable for a variety of special dietary needs. 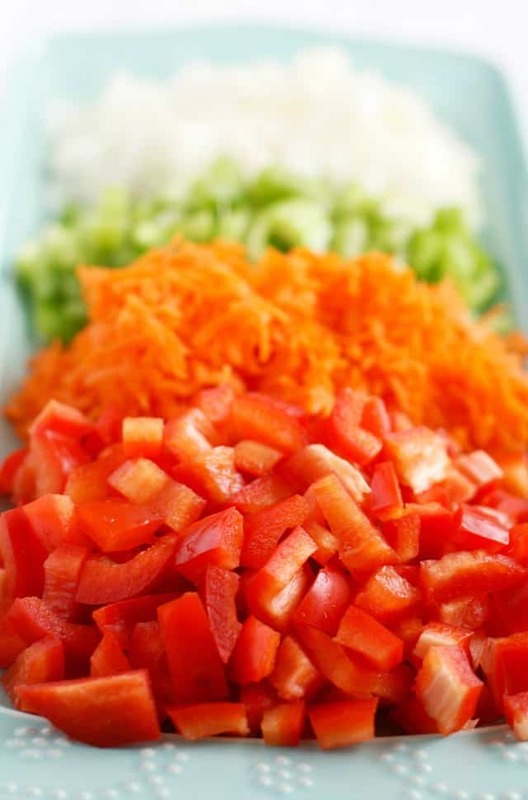 be creative – add different vegetables if you like, or try sweet pickle relish – it’s up to you! If you make this salad, or any of my other recipes, be sure to share on Instagram, and tag me @prettybeeblog. I love to see what you’re making! Simple, tasty, and colorful, this vegan macaroni salad is perfect for a summer barbecue! Once the macaroni is cooked, drain and rinse it under cold water to cool down. Put the vegan mayonnaise, apple cider vinegar, pickle relish, sugar, salt, pepper, and onion powder in a small bowl or jar. Stir well until combined. Place the cooled macaroni in a large bowl. Add the all of the vegetables and toss to combine. Add the dressing and stir until everything is coated. If you're making the salad ahead of time, keep the dressing and the other ingredients separate, then mix them when it's serving time. Leftovers will keep in the refrigerator for up to 4 days. This recipe was originally published in May 2015, and has been updated with an improved recipe and new photos. « The Best Classic Vegan Potato Salad. 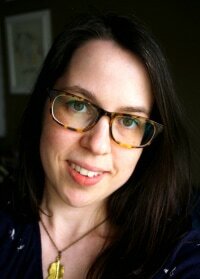 Thanks, Kelly! This was my lunch today. I had a green pepper (not a red one), so I threw in some chopped tomato to get a bit of color. I also added about half a small zucchini, all chopped up, to keep it veggin’. Very nice! I just love macaroni salad! It’s what I load up on the most at BBQ’s. 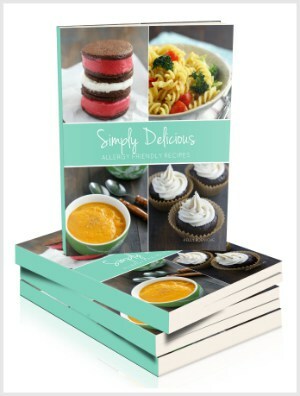 Loving this vegan version Kelly! 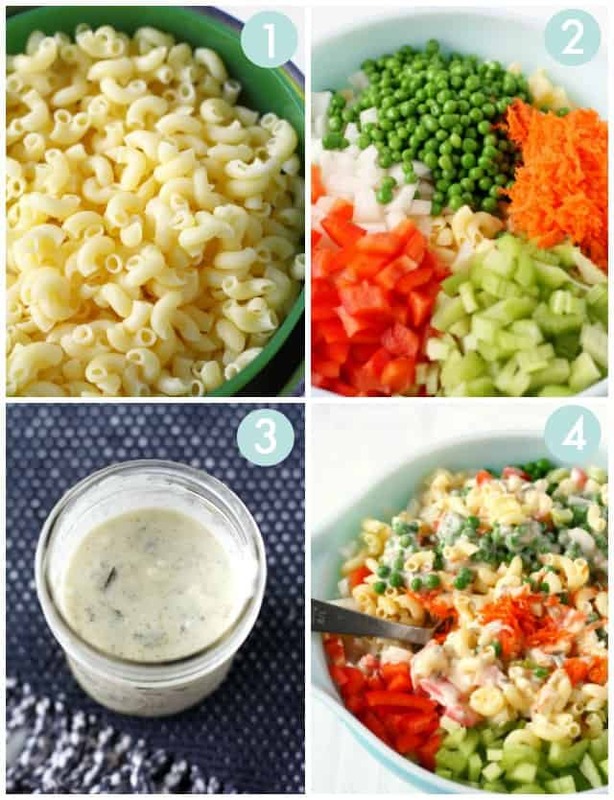 Macaroni salad is so fun to eat! I swear my coworker is eating the exact same thing right now. Both of you are making me really want to make and eat a macaroni salad! Love the extra addition of veggies. Yum! The pasta salad of my dreams! I cooked all weekend! Looks like you did some cooking, too! This salad looks soo delish, Kelly! What a pretty salad, Kelly! I love the veggies and dressing. Sounds so delicious! So perfect!! I love that this is vegan and GF and won’t make me regret my decision to eat half the batch in one sitting.